"The most exciting and powerful woman in the universe!" 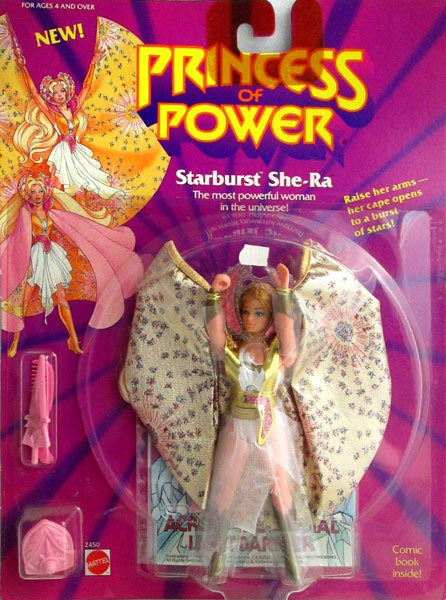 She-Ra: Princess of Power toys were produced by Mattel from 1984-87. 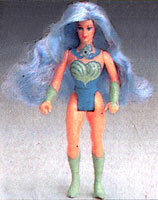 Each doll was 5-1/2 inches tall with brushable hair and came with various clothing and accessories. 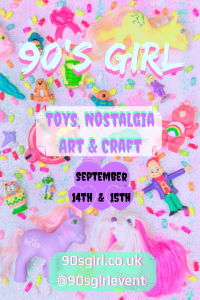 There were also winged horses which the dolls could ride along with several other animals, playsets, fashions and many other accessories for little girls to use plus an animated cartoon series. The line was discontinued in 1987. Images on this page are from various Mattel Catalogues, thanks to Nht Pirate or found on eBay ! View all She-Ra on eBay.com or eBay.co.uk ! 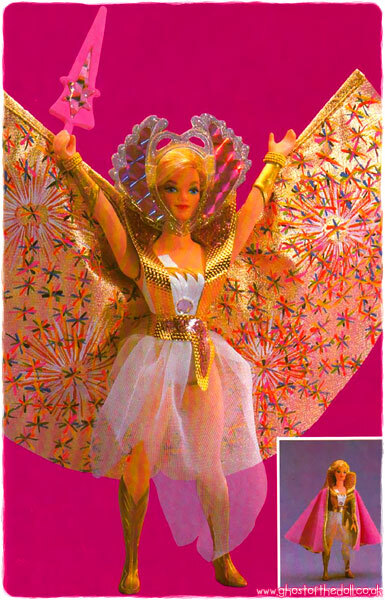 "Introducing glamorous new Princess of Power dolls that are as exciting as they are beautiful. They all have special action features, so children can pretend that they fly through the skies of Etheria or have wonderful magical powers. 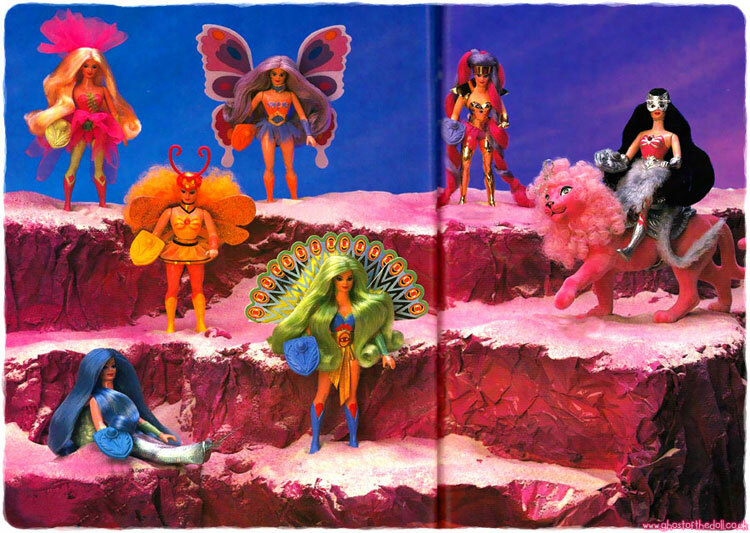 She-Ra's friends are Perfuma, the scent-sational flower maiden; Flutterina, the beautiful 'flying' lookout; SweetBee, a honey of a guide; PeekaBlue, a watchful "feathered" friend; and Mermista, a mist-i-fying mermaid. Scratchin' Sound Catra's mischievous friends are Entrapta, a tricky golden beauty and Clawdeen, a glamorous cat." 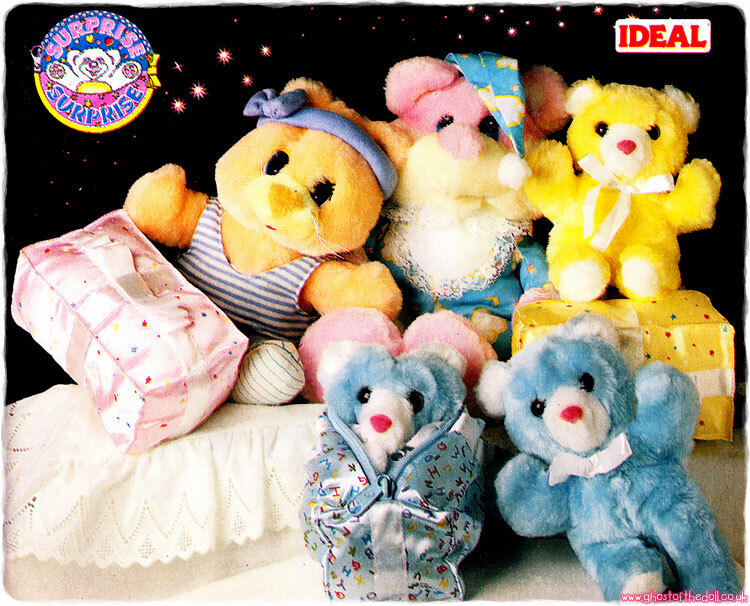 There were eight dolls produced in 1986. She-ra and Catra were re-released along with five new goodies and one new baddie. 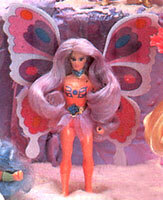 Every doll in the second series came with a different coloured shield and matching comb, mini-comic and various pieces of clothing. "Now the most powerful woman in the universe has a cape that opens to a burst of shimmering stars! 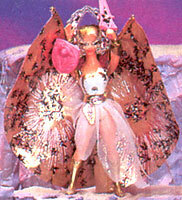 When her arms are down, children can pretend that she's the beautiful Princess Adora, wearing a lovely pink cape. 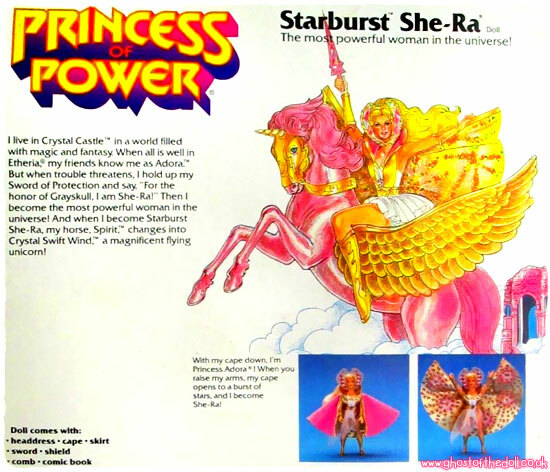 When there's trouble in Etheria, children can pretend that she raises her sword over her head and becomes Starburst She-Ra. 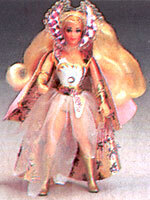 With her magnificent cape of stars, Starburst She-Ra is ready to defend Etheria!" The Dutch version came with a cassette tape. "Beautiful look out "flies" with fluttering wings! A pull cord on her back would make her wings flutter." 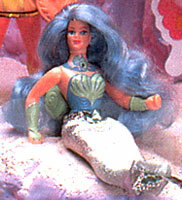 "Mist-I-flying mermaid! Make her spray water! " The shell on her back sprayed water through her necklace when squeezed. "Watchful feathered friend! Fan her "feathers" and she sees all!" Her feather backpack could open and close by a lever at the back. "Scent-sational flower maiden! Make her flower bloom. Smell her perfume!" Her pink flower backpack popped up when the lever was pushed. "Honey of a guide! Antennas and turn-around wings glow in the dark!" " Jealous beauty! Hear her "scratch" when you move her arms!" A lever on her back would move her arm up and down whilst she made a scratching sound. "Tricky golden beauty! With hair that traps!"